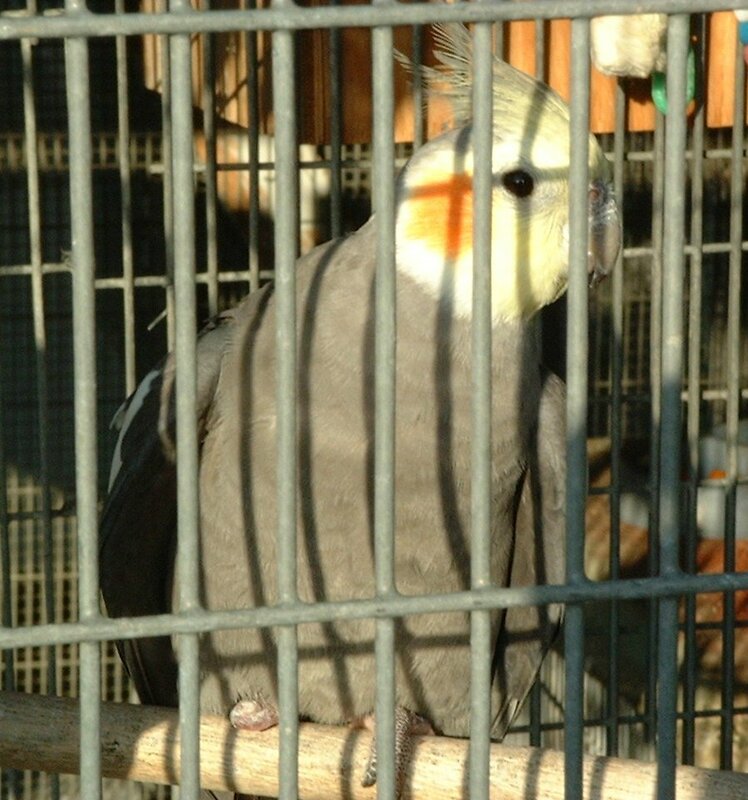 Today, most psittacine breeders either give their culled birds away or sell them into the pet trade. My grandpa is what I call an "old school breeder." He grew up when real culling was a common practice among all bird breeders. My grandpa still holds the philosophy that if there's anything wrong with it, you should snap its neck. He likes to talk birds with me, and kept telling me about birds with minor injuries that he "had to kill" because he didn't know what else to do, or didn't think a trip to the vet was worth the cost. After hearing more than a few neck-snapping stories, I demanded that he give me any bird he deemed disposable. 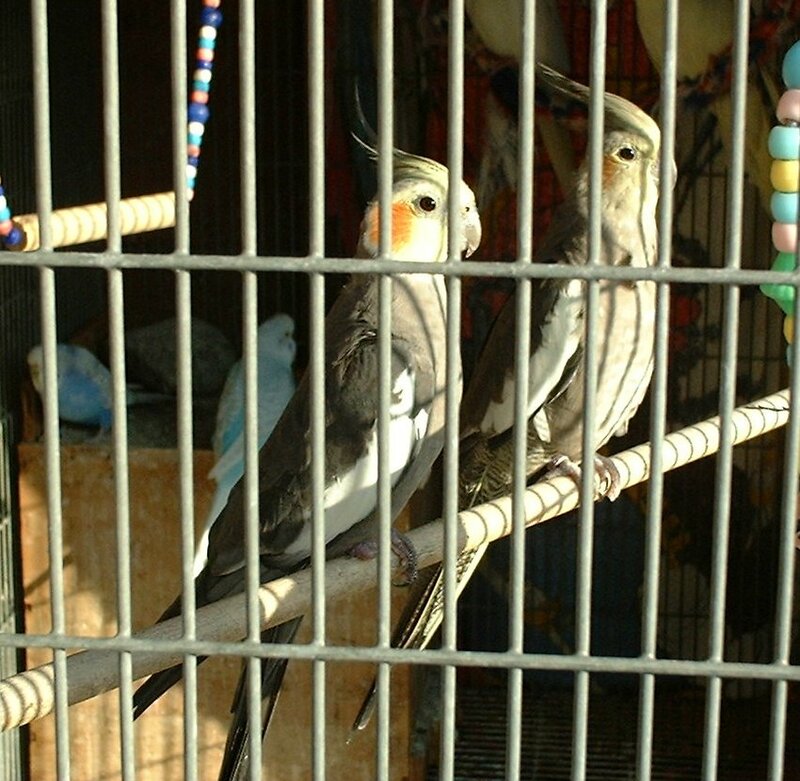 My grandpa had a handfed rosella in his aviary that kept going into the tiel nestboxes and attacking babies. 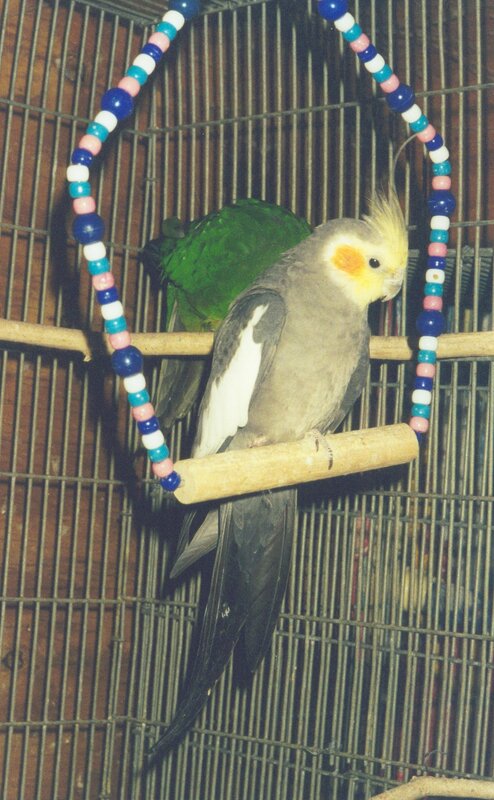 My grandpa had already culled more than a few of this bird's victims, which he thought were beyond help (he greatly overestimates the direness of bird injuries). When he called me about Honey, he was certain that the chick would die. "It's really beat up. I don't think it'll make it, but if you want to try..." I was therefore surprised to find a cockatiel chick with only a few minor cuts and bruises. He was missing feathers in a few places, the beak was slightly damaged and he had a small gash above one eye. I saw a strong, healthy chick with a few minor injuries from a bully. I tried to talk him into keeping it, since it was obvious that the bird would be fine, but my grandpa only saw a bird on the verge of death, and I couldn't convince him otherwise. I gave in and took the chick. 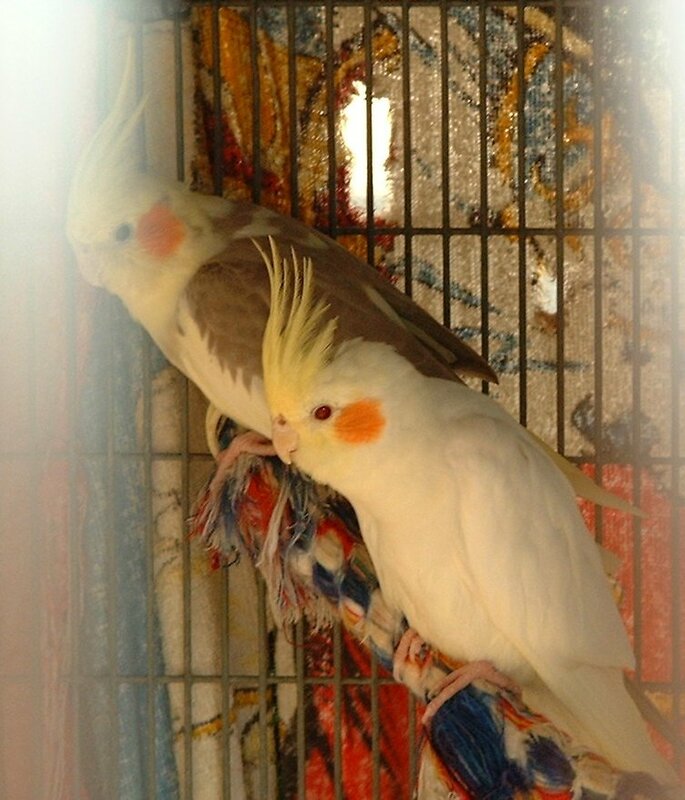 Not only did Honey survive, he's now one of my breeder birds, paired with a lovely pied hen. 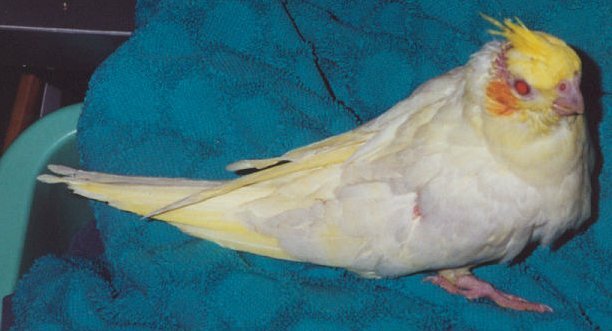 All that remains of his old injuries are a scar above the eye, a slightly curved beak tip and a small bald patch behind his head. Thrilled that I was taking his injured birds, my grandpa called me once again about a rosella-injured chick. This one had a really bad wound on its foot. When I examined the chick, I found a weird cut all the way around the foot, just below the ankle. "Are you sure this is a bite?" I asked. He assured me that it was, and I took the bird. Unfortunately, this one wasn't healing. A week later the foot looked no better, and I decided to examine the wound closer. It really didn't look like a bite, as it was completely circular. On much closer inspection, I found something poking out of the clotted blood. It looked like a fiber, and I tried to pull it out. Instead of coming out, it rotated. "Uh oh," I thought, "This is no bite." I cleaned off the blood as best I could, and found a piece of string wrapped so tightly that it had cut into the foot, almost down to the bone. I grabbed my sister and she reluctantly agreed to restrain the chick while I extracted the string. It wasn't easy (my sister wasn't great at restraining), but I got the string out just fine. Another week later and the foot was still not improving. This time I called my vet about possible amputation. 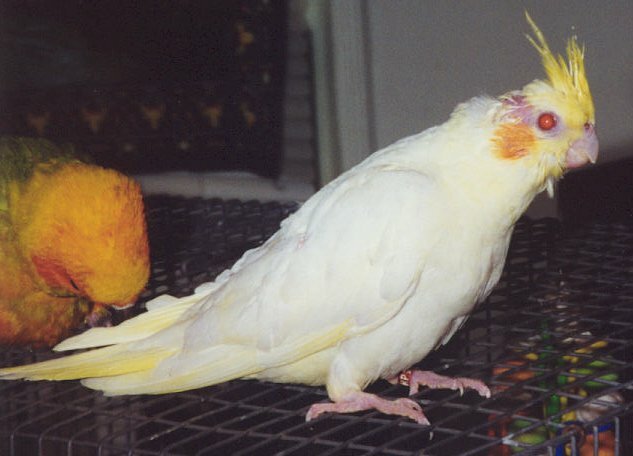 When I saw her, she said she rarely recommended amputation, especially in cockatiels, because they have a tendency to be very hard on their stumps. I agreed to give the foot another go, and she bandaged it and sent me home with antibiotics. The foot continued to go downhill, but at least I didn't have to worry about infection. Eventually the foot turned black and dropped off completely, leaving the ankle and just a little stub below it. The stub had a hard time healing as the bird learned to use it. After what my vet said about tiels and stumps, I began to worry that I'd be rebandaging his foot forever. Eventually he started ripping the bandage off, and I decided not to reapply it. His stub became crusty and damaged a few times, and had to be cleaned, but now he's learned to sit more on the good foot and just use the stub for balance. Last year, Lefty paired up with my oldest female, Melonie. I wondered if the leg would throw off his balance and leave him unable to copulate properly. Unfortunately, that's what happened. After two clutches of infertile eggs, Melonie, an experienced hen, figured out something was wrong and decided to mate with someone else. Incidently, that someone else happened to be Honey. Despite her extra-pair copulations, the pair remains closely bonded. Articles and images contained on this site are © 2003 by Karen Trinkaus unless otherwise noted and may not be reprinted or used in any way without the author's permission.